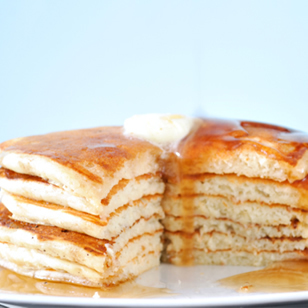 Vanilla Pancakes, Appetizers & Meals: Southern Flavoring Company, Inc. In a medium bowl, add eggs, milk, flour, sugar, salt, baking soda and Happy Home© Imitation Clear Vanilla, mix well. Drop batter by the ¼ cup onto hot, greased skillet or griddle. Cook until bubbles form on top side, then flip pancake over and brown on the other side. Serve warm with butter or berries and maple syrup. If freezing, allow them to cool completely and place them, separated by wax paper, in a freezer bag. Freeze for up to 6 weeks.